The firefighters convinced voters to sign their initiative petition by promising that signing it would not make it law, but would only get it on the ballot so the people could vote on it. The firefighters also promised their initiative would save tax money and preserve our fire department. I want to thank City Council members Bill Fisher, Suzanne Fuentes, and Carl Jacobson for voting on February 15 to put the firefighter union’s Punitive Initiative, Measure P, on the latest possible ballot – in April 2012. Their votes will save taxpayer money by avoiding an unnecessary special election, and much more tax money indirectly. But more importantly, their votes may save lives – especially the lives of our seniors. The latest election date postpones the time residents will permanently lose their City-operated paramedic transport service, and be forced to use out-of-town ambulance companies with increased hospital transport times and fees, if enough voters are misled into approving the Punitive Initiative. The union’s Punitive Initiative cuts emergency services to lock-in and pay for their wildly excessive and unsustainable employee salaries, benefits, and pensions. The latest election date can save $90 million over ten years in excess “special compensation” and pension contributions by giving the City Council more time to implement real and superior alternatives that save twice as much money without cutting our emergency services. I was very happy to see (via a complaining letter-to-the editor in the ES Herald) that the ESPD mounted a targeted offensive against the proliferation of CRV bottle thieves who have been prowling our streets, digging for recycle profits. I am glad to read that the ESPD apparently made arrests in the case, because in the past the offenders have generally been ‘advised and released’, to leave with their stolen property. 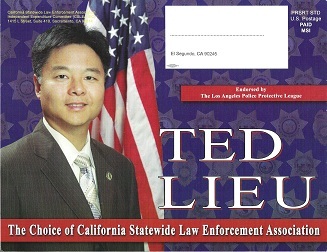 El Segundo voters received a campaign mailer for Ted Lieu, a soft-on-crime, tax-and-spend leftist politician running for state senate in the extremely gerrymandered California Senate District 28 (CA SD 28). The campaign mailer featured 36 deceptive government employee union endorsements made to look like legitimate public safety endorsements, and 38 counterfeit badges which are actually government employee union logos. Soft-on-crime, tax-and-spend politicians frequently use the cover of deceptive government employee union endorsements to masquerade as tough-on-crime, fiscally conservative politicians. 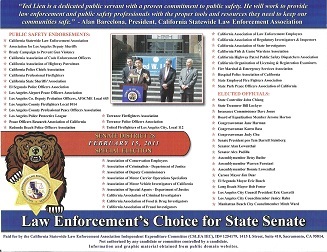 Front side of Ted Lieu’s campaign mailer featuring 36 deceptive government employee union endorsements and 38 counterfeit badges which are actually union logos. Back side of Ted Lieu’s campaign mailer featuring 36 deceptive government employee union endorsements and 38 counterfeit badges which are actually union logos. The El Segundo Police Department is currently conducting an undercover sting operation targeting people who are getting recycle cans and bottles from the curbside bins. I was witness to an arrest made by two uniformed policemen in two undercover cars, with a third black & white vehicle and another officer to transport the man to jail. Why so many needed to cruise the streets? The man involved was removing about 40 cents worth of aluminum cans from my neighbor’s trash. Mayor Busch is so concerned about the current trash contract and the $123,000 that, he professes, “could” have been saved. Quit looking for spare change in the “city’s sofa cushions.” I would like to point out the fact that this mayor and others have continually skirted “other” serious costs to the city of El Segundo. 1) $197,000 a year: The parking structure (paid with 1.1 million taxpayers dollars), and a 34 year contract for parking places that still has over 25 years left to go. Reason? For a financial political payment to a politician. 2) Over 3 million dollars a year to the fire fighters union, not in wages, but special compensation, like the one that is continually paid year after year, even after retirement, just because at one time, in their past life, they received a diploma. Reason? Payment again for political support. The Feb. 3 edition of the El Segundo Herald had a front-page article entitled “Free Trash (collection) to Continue…” Let’s get one thing straight! There is no such thing as free trash collection in El Segundo and your contributing writer, Brian Simon, fully knows that; so why does he use the front page of the newspaper to perpetuate his cockamamie lies by continuously repeating “free trash collection”? El Segundo voters have now soundly rejected both the Business Utility Tax Increase and Trash Fee Proposal, sending a strong and clear message to Council and unions-get our labor expenses permanently under control. Residents/ taxpayers expect and deserve public services, especially fire and police, to be provided at realistic costs, not those unions demand. We don’t support salary/benefit arrangements placing a number of employees in the top five percent income bracket nationwide, nor bloated staffing levels. We don’t wish to pay the employee share of CalPERS retirement contributions or “special pay” supplements, further spiking total compensation. Pandering to union agendas, for whatever reason, must stop now. I recently received a mailer for Ted Lieu, candidate for State Senate. On that flyer were 37 public employee union endorsements by local and state unions. There was not a single tax payer or government watchdog association. Why would anyone be foolish enough to think this man is running to represent the voters? The county fire department transfer proposal requires that the city of El Segundo pay off all accrued vacation and sick leave of the city fire personnel before they are transferred to the county. According to the “Daily Breeze” there were two El Segundo city officials that were paid a combined total of $321,000 in accrued vacation and sick leave during 2009. How much do you think it will cost the city to pay off the accrued time for all members of the fire department?